NASA's twin Voyager spacecraft launched in August and September 1977. 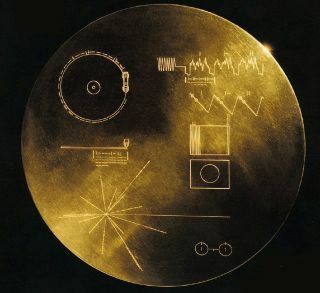 Aboard each spacecraft is a golden record, a collection of sights, sounds and greetings from Earth. There are 117 images and greetings in 54 languages, with a variety of natural and human-made sounds like storms, volcanoes, rocket launches, airplanes and animals. Editor's Note: This archive was updated Sept. 15 with SPACE.com's latest Voyager 1 news. Check it out below! NASA's Voyager 1 probe has made space exploration history by becoming the first spacecraft from Earth to leave the solar system behind and enter interstellar space. How Big Is the Solar System? Voyager 1 has left the solar system. The big news that the spacecraft reached interstellar space on or around Aug. 25, 2012, after its decades-long sojourn, begs the question: Just how far did it have to travel to knock on cold, dark space's door? From our sister site Livescience. What Will Voyager 1 Find? NASA's Voyager 1 probe won't rest on its laurels after becoming the first manmade object ever to reach interstellar space. Here's what it may find. NASA's Voyager 1 spacecraft nearly 12 billion miles from Earth is still phoning home from interstellar space, and a new NASA photo captures that radio signal as pale blue speck in a cosmic ocean. Now that NASA's Voyager 1 probe has left the solar system, its next big spaceflight milestone comes with the flyby of another star — in 40,000 years. For NASA, it's official: Voyager 1 has entered interstellar space. But given the many false alarms over the years, what makes scientists so confident now? Thanks to NASA's far-flung Voyager 1 spacecraft, which left the solar system in August 2012, now everyone here on Earth can listen to the sound of interstellar space. NASA's Voyager 1 probe left the solar system last August, researchers announced today (Sept. 12). SPACE.com caught up with Voyager project scientist Ed Stone to discuss Voyager 1's historic achievement and what's next for the venerable probe. Take a look at five of our favorite facts about NASA's distant Voyager 1 and 2 spacecraft here. NASA's Voyager 1 and 2 probes launched in 1977 to visit the outer planets of the solar system. After 35 years in space, the twin probes are approaching the edge of our solar system. A graphical representation of our solar system to scale - see how far the planets are from the sun in astronomical units. See images from NASA's twin Voyager probes, the farthest spacecraft from Earth. SPACE.com will have more news and features on Voyager 1's historic spaceflight milestone in the days to come. Quiz: How Well Do You Know Our Solar System? Follow us @Spacedotcom, Facebook and Google+.